This overview has been adapted from Dean Jenkins's and Stephen Gerred's ECGlibary.com, for which they are gratefully acknowledged. The history of the ECG goes back more than one and a half centuries. 1660. Otto Von Guericke builds the first static electricity generator. 1664. 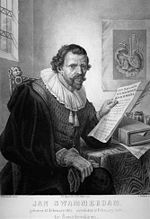 Jan Swammerdam, a Dutchman, disproves Descartes' mechanistic theory of animal motion by removing the heart of a living frog and showing that the frog is still able to swim. When the brain is removed all movement stops (which could be in keeping with Descarte's theory) but then, when the frog is dissected and a severed nerve end stimulated with a scalpel, the muscles twitch. This proves that movement of a muscle can occur without any connection to the brain.Therefore the transmission of 'animal spirits' is not necessary. Swammerdam's ideas are not widely known and his work is not published until after his death. However, he writes many letters and his friend, Nicolaus Steno, attacks Cartesian ideas in a lecture in Paris in 1665. Boerhaave publishes Swammerdam's 'Book of Nature' in the 1730s.It is translated into English in 1758. 1668 Swammerdam refines his experiments on muscle contraction and nerve conduction. He demonstrates some of his work to notable figures such as the Grand-Duke Cosimo of Tuscany when the Grand Duke visits Swammerdam's father's house on the Oude Schans in Amsterdam. In one experiment he suspends a muscle on a brass hook inside a glass tube with a water droplet, to detect movement, and 'irritates' the nerve with a silver wire. This produces movement of the muscle, which may be due to the induction of a small electrical charge - although Swammerdam is unaware of this. 1729 Stephen Gray, English scientist, distinguishes between conductors and insulators of electricity. He demonstrates the transfer of static electrical charge to a cork ball across 150 meters of wet hemp thread. Later he finds that the transfer can be achieved over greater distances through brass wire. 1745 Dutch physicist Pieter van Musschenbroek discovers that a partly filled jar with a nail projecting from a cork in its neck can store an electrical charge. The jar is named the 'Leyden Jar' after the place of its discovery. 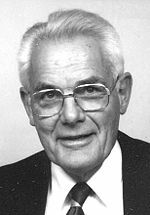 Ewald Georg von Kliest of Pomerania invents the same device independently. Using a Leyden jar in 1746, Jean-Antoine Nollet, French physicist and tutor to the royal family of France, sends an electrical current through 180 Royal Guards during a demonstration for King Louis XV. 1774 The Rev. Mr Sowdon and Mr Hawes, apothecary, report on the surprising effects of electricity in a case report of recovery from sudden death published in the annual report of the newly founded Humane Society (now the Royal Humane Society). The Society develops from 'The Institution for Affording Immediate Relief to Persons Apparently Dead from Drowning'. It is "instituted in the year 1774, to protect the industrious from the fatal consequences of unforseen accidents; the young and inexperienced from being sacrificed to their recreations; and the unhappy victims of desponding melancholy and deliberate suicide from the miserable consequences of self-destruction." A Mr Squires, of Wardour Street, Soho, lives opposite the house from which a three year old girl, Catherine Sophia Greenhill falls from a window on 16th July 1774. After the attending apothecary declares that nothing could be done for the child, Mr Squires, "with the consent of the parents very humanely tried the effects of electricity. 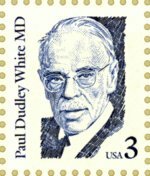 At least twenty minutes had elapsed before he could apply the shock, which he gave to various parts of the body without any apparent success; but at length, upon transmitting a few shocks through the thorax, he perceived a small pulsation: soon after the child began to sigh, and to breathe, though with great difficulty. In about ten minutes she vomited: a kind of stupor, occasioned by the depression of the cranium, remained for some days, but proper means being used, the child was restored to perfect health and spirits in about a week. "Mr. Squires gave this astonishing case of recovery to the above gentlemen, from no other motive than a desire of promoting the good of mankind; and hopes for the future that no person will be given up for dead, till various means have been used for their recovery." 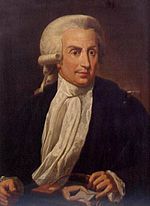 Italian Anatomist Luigi Galvani notes that a dissected frog's leg twitches when touched with a metal scalpel. He has been studying the effects of electricity on animal tissues this summer. On 20th September 1786 he wrote, "I had dissected and prepared a frog in the usual way and while I was attending to something else I laid it on a table on which stood an electrical machine at some distance from its conductor and separated from it by a considerable space. Now when one of the persons present touched accidentally and lightly the inner crural nerves of the frog with the point of a scalpel, all the muscles of the legs seemed to contract again and again as if they were affected by powerful cramps." 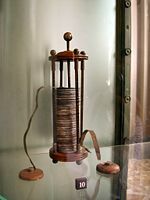 Galvani's name is given to the 'galvanometer', an instrument for measuring (and recording) electricity - this is essentially what an ECG is; a sensitive galvanometer. 1788 Charles Kite wins the Silver Medal of the Humane Society (awarded at the first prize medal ceremony of the Society, co-judged with the Medical Society of London) with an essay on the use of electricity in the diagnosis and resuscitation of persons apparently dead. This essay is often cited as the first record of cardiac defibrillation, but the use of electricity suggested by Mr Kite is much different. For example, on describing a case of drowning from 1785, in which resuscitation was attempted with artificial respiration, warmth, tobacco, "volatiles thrown into the stomach, frictions, and various lesser stimuli" for nearly an hour, he then recalls the use of electricity. "Electricity was then applied, and shocks sent through in every possible direction; the muscles through which the fluid [electricity] passed were thrown into strong contractions." He concludes that electricity is a valuable tool that can be used to resuscitate a person who appeared dead. Annual Report 1788: Humane Society, London. pp 225-244. Kite C. An Essay on the Recovery of the Apparently Dead. 1788: C. Dilly, London. 1792 Alessandro Volta, Italian Scientist and inventor, attempts to disprove Galvani's theory of "animal electricity'" by showing that electrical current is generated by the combination of two dissimilar metals. 1819 While demonstrating to students the heating of a platinum wire with electricity from a voltaic pile at the University of Copenhagen, Danish physicist Hans Christian Oersted notices that a nearby magnetized compass needle moves each time the electrical current is applied. He discovers electromagnetism, which is given a theoretical basis (with remarkable speed) by André Marie Ampère. 1820 Johann (Johan) Schweigger of Nuremberg increases the movement of magnetized needles in electromagnetic fields. He finds that wrapping the electric wire into a coil of 100 turns multiplies the effect on the needle. He proposes that a magnetic field revolved around a wire carrying a current. This was later proven by Michael Faraday. Schweigger announces his discovery at the University of Halle on 16th September 1820. 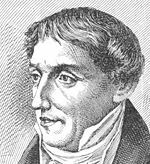 1825 Leopold Nobili, Professor of Physics at Florence, develops an 'astatic galvanometer'. Using two identical magnetic needles of opposite polarity, either fixed together with a figure of eight arrangement of wire loops (in earlier versions), or one movable needle with a wire loop and one with a scale (in later versions), Nobili is able to compensate for the effects of the earth's magnetic field. In 1827, using this instrument, he manages to detect the flow of current in the body of a frog from muscles to spinal cord. He detects the electricity running along saline-moistened cotton thread joining the dissected frog's legs in one jar to its body in another jar. Nobili feels that this work proves the theory of animal electricity. 1843 German physiologist Emil Du Bois-Reymond describes an "action potential" accompanying each muscular contraction. He detects the small voltage potential present in resting muscle and notes that this diminishes with contraction of the muscle. To accomplish this he had develops one of the most sensitive galvanometers of his time. His device has a wire coil with over 24,000 turns - 5 km of wire. Du Bios Reymond devises a notation which he called the 'disturbance curve' for his galvanometer. "O" was the stable equilibrium point of the astatic galvanometer needle and p, q, r and s (and also k and h) were other points in its deflection. Du Bois-Reymond, E. Untersuchungen uber thierische Elektricitat. Reimer, Berlin: 1848. 1856 Rudolph von Koelliker and Heinrich Muller confirm that an electrical current accompanies each heart beat by applying a galvanometer to the base and apex of an exposed ventricle. They also apply a nerve-muscle preparation, similar to Matteucci's, to the ventricle and observe that a twitch of the muscle occurs just prior to ventricular systole, followed by a much smaller twitch after systole. These twitches will later be recognized as caused by the electrical currents of the QRS and T waves. von Koelliker A, Muller H. Nachweis der negativen Schwankung des Muskelstroms am naturlich sich kontrahierenden Herzen. Verhandlungen der Physikalisch-Medizinischen Gesellschaft in Wurzberg. 1856;6:528-33. 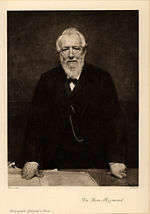 1858 William Thompson (Lord Kelvin), professor of natural philosophy at Glasgow University, invents the 'mirror galvanometer' for the reception of transatlantic telegraph transmissions. A small, freely rotating mirror, with magnets stuck to its back, is suspended in a fine copper coil and a reflected spot of light from this mirror 'amplifies' small movements when electrical current is present. The whole apparatus is suspended in an air chamber and the pressure inside can be adjusted to vary the damping seen on the signals. This galvanometer is sensitive enough for transatlantic telegraphy. 1867 Thompson improves telegraph transmissions with the 'Siphon Recorder'. Before d'Arsonval (1880), Thompson uses a fine coil suspended in a strong magnetic magnetic field. Attached to the coil but isolated from it by ebonite (an insulator) is a siphon of ink. The siphon is charged with high voltage so that the ink is sprayed onto the paper, which moved over a metal surface. The siphon recorder could therefore not only detect currents; it could also record them onto paper. 1869-70 Alexander Muirhead, an electrical engineer and pioneer of telegraphy, possibly records a human electrocardiogram at St Bartholomew's Hospital, London but this is disputed. He is thought to have used a Thompson Siphon Recorder. Elizabeth Muirhead, his wife, writes a book of his life, claiming that he refrained from publishing his own work for fear of misleading others. Elizabeth Muirhead. Alexander Muirhead 1848 - 1920. Oxford, Blackwell: privately printed 1926. 1872 French physicist Gabriel Lippmann invents a capillary electrometer. It is a thin glass tube with a column of mercury beneath sulfuric acid. The mercury meniscus moves with varying electrical potential and is observed through a microscope. 1872 Mr Green, a surgeon, publishes a paper on the resuscitation of a series of patients who suffered cardiac and/or respiratory arrest during anesthesia with chloroform. He uses a galvanic pile (battery) of 200 cells generating 300 Volts, which he applies to the patient as follows "One pole should be applied to the neck and the other to the lower rib on the left side." Green T. On death from chloroform: its prevention by galvanism. Br Med J 1872 1: 551-3. Although this has been reported as an example of cardiorespiratory resuscitation, it is unclear what the exact mechanism seems to be. It is unlikely to be electric cardioversion or external pacing. It seems to be another example of electrophrenic stimulation (See also Duchenne 1872). 1874 A. Vulpian described mouvement fibrillaire in his article published in 1874, which would be the basis for the name ventricular fibrillation now used for this arrhythmia. 1875 Richard Caton, a Liverpool physician, presents to the British Medical Association in July 1875 in Edinburgh. Using a Thompson 'mirror galvanometer' in animals he shows it is possible to detect 'feeble currents of varying direction ... when the electrodes are placed on two points of the external surface, or one electrode on the grey matter and one on the surface of the skull'. This is the first report of the EEG (or electroencephalogram). 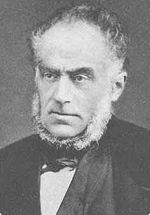 Caton was proving another Physician's hypothesis, John Hughlings Jackson, who suggested in 1873 that epilepsy was due to excessive electrical activity in the grey matter of the brain. Caton R: The electric currents of the brain. BMJ 1875; 2:278, Mumenthaler, Mattle Eds. Neurology. 4th Edition. Stuttgart, Thieme: 2004. 1887 British physiologist Augustus D. Waller of St Mary's Medical School, London publishes the first human electrocardiogram. It is recorded with a capilliary electrometer from Thomas Goswell, a technician in the laboratory. This is shortly after the "Cruelty to Animals Act" is accepted in the British parliament, which leads to questions in the House of Commons. 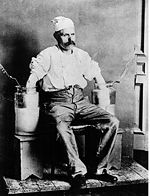 1887 McWilliam provides the first detailed description of VF, and demonstrated how VF in man can be terminated by electric shocks applied through a large pair of electrodes; the first description of defibrillation in man. 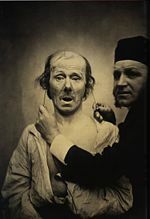 1889 Dutch physiologist Willem Einthoven sees Waller demonstrate his technique at the First International Congress of Physiologists in Bale. 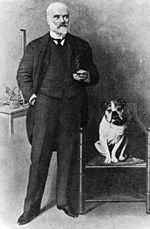 Waller often demonstrated by using his dog "Jimmy" who would patiently stand with paws in glass jars of saline. Why PQRST and not ABCDE? The four deflections prior to the correction formula are labeled ABCD and the 5 derived deflections are labeled PQRST. The choice of P is a mathematical convention (as used also by Du Bois-Reymond in his galvanometer's 'disturbance curve' 50 years previously) by using letters from the second half of the alphabet. N has other meanings in mathematics and O is used for the origin of the Cartesian coordinates. In fact Einthoven uses O ..... X to mark the time line on his diagrams. P is simply the next letter. A lot of work has been undertaken to reveal the true electrical waveform of the ECG by eliminating the damping effect of the moving parts in the amplifiers and using correction formulae. 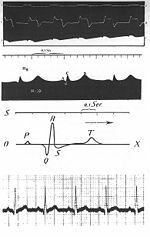 If you look at the diagram in Einthoven's 1895 paper you will see how close it is to the string galvanometer recordings and the electrocardiograms we see today. The image of the PQRST diagram may be striking enough to be adopted by the researchers as a true representation of the underlying form. It would then be logical to continue the same naming convention when the more advanced string galvanometer starts creating electrocardiograms a few years later. 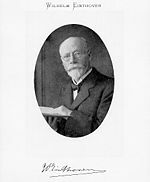 1899 Karel Frederik Wenckebach publishes a paper "On the analysis of irregular pulses" describing impairment of AV conduction leading to progressive lengthening and blockage of AV conduction in frogs. This will later be called Wenckebach block (Mobitz type I) or Wenckebach phenomenon. Einthoven starts transmitting electrocardiograms from the hospital to his laboratory 1.5 km away via telephone cables. On March 22nd the first 'telecardiogram' is recorded from a healthy and vigorous man and the tall R waves are attributed to his cycling from laboratory to hospital for the recording. 1907 Arthur Cushny, professor of pharmacology at University College London, publishes the first case report of atrial fibrillation. His patient was 3 days post-op following surgery on an "ovarian fibroid" when she developed a "very irregular" pulse at a rate of 120 - 160 bpm. Her pulse was recorded with a "Jacques sphygmochronograph" which shows the radial pulse pressure against time - much like the arterial line blood pressure recordings used in Intensive Care today. Cushny AR, Edmunds CW. Paroxysmal irregularity of the heart and auricular fibrillation. Am J Med Sci 1907;133:66-77. 1908 Edward Schafer of the University of Edinburgh is the first to buy a string galvanometer for clinical use. 1911 Levy & Lewis demonstrate that when VF occurred during chloroform anesthesia, it was often preceded by the appearance of multiform ventricular premature beats or ventricular tachycardia. Thomas Lewis publishes a classic textbook. The mechanism of the heart beat. London: Shaw & Sons and dedicates it to Willem Einthoven. Hoffman published the first ECG of ventricular fibrillation in man. 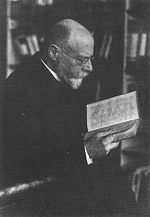 1924 Willem Einthoven wins the Nobel prize for inventing the electrocardiograph. 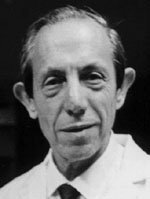 1924 Woldemar Mobitz publishes his classification of heart blocks (Mobitz type I and type II) based on the electrocardiogram and jugular venous pulse waveform findings in patients with second degree heart block. Mobitz W. Uber die unvollstandige Storung der Erregungsuberleitung zwischen Vorhof und Kammer des menschlichen Herzens. (Concerning partial block of conduction between the atria and ventricles of the human heart). Z Ges Exp Med 1924;41:180-237. 1926 A doctor from the Crown Street Women's Hospital in Sydney, who wishes to remain anonymous, resuscitates a new-born baby with an electrical device later called a 'pacemaker'. The doctor wants to remain anoymous because of the controversy surrounding research that artificially extends human life. 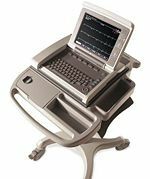 1928 Frank Sanborn's company (founded 1917 and acquired by Hewlett-Packard in 1961 and since 1999, Philips Medical Systems) converts their table model electrocardiogram machine into their first portable version weighing 50 pounds and powered by a 6-volt automobile battery. 1929 Sydney doctor Mark Lidwill, physician, and Edgar Booth, physicist, report the electrical resuscitation of the heart to a meeting in Sydney. Their portable device uses an electrode on the skin and a transthoracic catheter. Edgar Booth's design could deliver a variable voltage and rate and is employed to deliver 16 volts to the ventricles of a stillborn infant. 1938 Tomaszewski notes changes to the electrocardiogram in a man who died of hypothermia. Tomaszewski W. Changements electrocardiographiques observes chez un homme mort de froid. Arch Mal Coeur 1938;31:525. 1940 Neuton Stern (student of Lewis)describes and names the "take off, or junction of the R-T (S-T) segment" as the J-point. Am Heart J 1940;20:355-356. 1942 Emanuel Goldberger increases the voltage of Wilson's unipolar leads by 50% and creates the augmented limb leads aVR, aVL and aVF. When they are added to Einthoven's three limb leads and the six chest leads, the 12 lead ECG that we know today emerges. 1944 Young and Koenig report deviation of the P-R segment in a series of patients with atrial infarction. Young EW, Koenig BS. Auricular infarction. Am Heart J. 1944;28:287. 1953 Osborn, while experimenting with hypothermic dogs, describes the prominent J (junctional) wave, often known as the "Osborn wave". He found the dogs were more likely to survive if they had an infusion of bicarbonate and supposed the J wave was due to an injury current caused by acidosis. Osborn JJ. Experimental hypothermia: respiratory and blood pH changes in relation to cardiac function. Am J Physiol 1953;175:389. 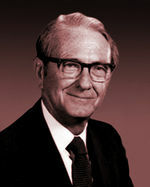 1955 Richard Langendorf publishes the "rule of bigeminy" whereby ventricular bigeminy tends to perpetuate itself. Langendorf R, Pick A, Winternitz M. Mechanisms of intermittent ventricular bigeminy. I. Appearence of ectopic beats dependent upon the length of the ventricular cycle, the "rule of bigeminy." circulation 1955;11:442. 1958 Professor Ake Senning, of Sweden, places the first implantable cardiac pacemaker designed by Rune Elmqvist into a 43-year-old patient with complete heart block and syncope (Arne Larsson). 1960 Smirk and Palmer highlight the risk of sudden death from ventricular fibrillation; particularly when ventricular premature beats occur at the same time as the T wave. The 'R on T' phenomenon. Smirk FH, Palmer DG. A myocardial syndrome, with particular reference to the occurrence of sudden death and of premature systoles interrupting antecedent T waves. Am J Cardiol 1960;6:620. 1968 Journal of Electrocardiography, the Official Journal of the International Society for Computerized Electrocardiology and the International Society of Electrocardiology, is founded by Zao and Lepeschkin. 69-year-old black male; no chest pain; troponin 0.17 ng/mL. "Baseline" (top). Current (bottom) two years later; Wellens' warning. Descartes R. De Homine (Treatise of Man); 1662: Moyardum & leffen, Leiden. Bancroft, E. An essay on the natural history of Guiana, London:T. Becket and P. A. de Hondt, 1769. Abildgaard, Peter Christian. Tentamina electrica in animalibus. Inst Soc Med Havn. 1775; 2:157-61. Prevost JL, Batelli F: Sur quelques effets des descharges electriques sur le coeur des mammiferes. Acad. Sci. Paris, FR. : 1899; 129:1267-1268. Hay J. Bradycardia and cardiac arrhythmias produced by depression of certain functions of the heart. Lancet 1906;1:138-143. Lewis T. Auricular fibrillation: a common clinical condition. BMJ 1909;2:1528. Sanders, A.O. 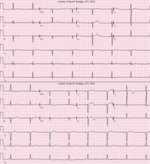 Coronary thrombosis with complete heart block and relative ventricular tachycardia: a case report, American Heart Journal 1930;6:820-823. Wilson NF, Johnston FE, Macleod AG, Barker PS. Electrocardiograms that represent the potential variations of a single electrode. Am Heart J. 1934;9:447-458. McGinn S, White PD. Acute cor pulmonale resulting from pulmonary embolism: its clinical recognition. JAMA 1935;114:1473. Gouaux JL, Ashman R. Auricular fibrillation with aberration simulating ventricular paroxysmal tachycardia. Am Heart J 1947;34:366-73. Beck CS, Pritchard WH, Feil SA: Ventricular fibrillation of long duration abolished by electric shock. JAMA 1947; 135: 985-989. Holter NJ, Generelli JA. Remote recording of physiologic data by radio. Rocky Mountain Med J. 1949;747-751. Marriott HJL. Fogg E: Constant monitoring for cardiac dysrhythmias and blocks. Volume XXXIX, No. 6: Modern Concepts of Cardiovascular Disease 39:103; June 1970. Du Bois-Reymond, E. Untersuchungen über thierische Elektricität. Reimer, Berlin: 1848. Chauveau MA. De La Dissociation Du Rythme Auriculaire et du Rythme Ventriculaire. Rev. de Méd. Tome V. - Mars 1885: 161-173. This page was last edited on 20 November 2016, at 22:25.